Countless nineteenth-century travelogues were written by Britons visiting the settler colonies: Charles Dickens wrote about his time in North America, Anthony Trollope described his travels in Australasia and South Africa, Rudyard Kipling wrote about all of the above. Far less common and less celebrated are recorded journeys from the other perspective: Americans or Australians travelling to and from the United Kingdom. Washington Irving provides an early exception. Irving is best known for his now-classic tales “Legend of Sleepy Hollow” and “Rip Van Winkle,” but my favourite work from his pen is an 1819 essay called “The Voyage.” Irving describes the feelings of an American traveling to Britain for the first time. Turning the tables on British expectations, Irving presents an American traveller readying himself for “the bustle and novelties of another world,” savouring “the delicious throng of sensations which rush into an American’s bosom, when he first comes in sight of Europe.” Anticipating the self-assured American traveller of the twentieth and twenty-first centuries, Irving’s narrator feels no shame in his lineage; if anything it gives him fresh eyes to appreciate the old world. Irving’s essay came to mind while I was contemplating one of the most famous images of nineteenth-century Australian painting, Tom Roberts’s 1886 “Coming South.” I was in Melbourne for a conference which happened to coincide with a propitious birthday. I couldn’t escape for the whole day, so I treated myself to (what else) a brief afternoon visit to the National Gallery of Victoria. My goal was Roberts’s painting, but I wandered the galleries with no luck. Finally I asked a guard if he knew the work. “Oh, you mean the migration painting?” That’s the one. Ford Madox Brown, The Last of England. 1855. Oil on panel. Birmingham Museums and Art Gallery. Roberts’s image isn’t the most famous painting associated with immigrant travellers on their way to Australia. That distinction would surely go to Ford Madox Brown’s glowering 1855 The Last of England. Brown was inspired by the 1852 emigration of a friend, the sculptor Thomas Woolner. Woolner traveled to Australia to try his hand first at gold prospecting then at sculpting, but his limited success caused him to make a permanent return to the United Kingdom in 1854—a reminder that immigration is not always a one-way ticket. 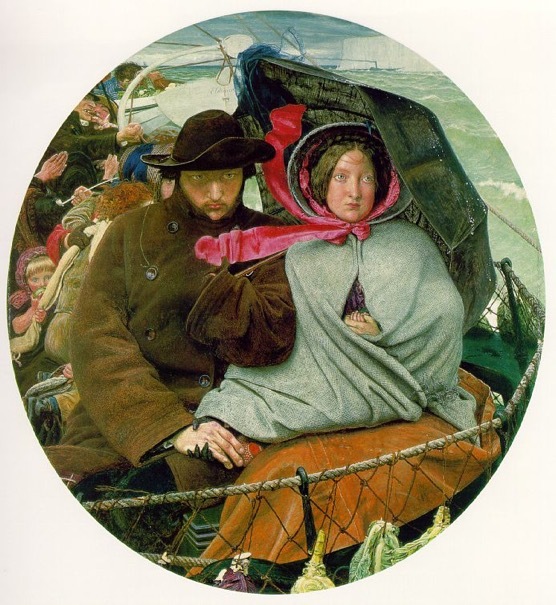 But Woolner’s departure motivated Brown to create an iconic image of a melancholy, bundled-up family (a self-portrait of Brown, his wife and their children) accompanied by a crowd of unsavoury limbs and faces as they depart the rainy, white cliffs of Dover for an uncertain future. Coming South is a far more pleasant affair, but it also rewards careful attention. Roberts himself had a complex national history. Born in Dorchester in 1856, he immigrated to Australia at age 13, returned to England to study at the Royal Academy from 1881 to 1885, then settled in the Melbourne area for almost two decades. From 1903 to 1923 he lived in the United Kingdom, chasing fame and fortune, but finally returned to Australia where he worked until his death in 1931. Today considered a thoroughly Australian artist, and one who helped create Australian colonial identity, he actually spent almost half his life in England. He never achieved great success in the country of his birth, but a number of his paintings have become iconic images in his adopted homeland. Tom Roberts, Coming South. 1886. Oil on canvas. National Gallery of Victoria. Coming South was produced soon after Roberts’s return to Australia after four years at the Royal Academy. 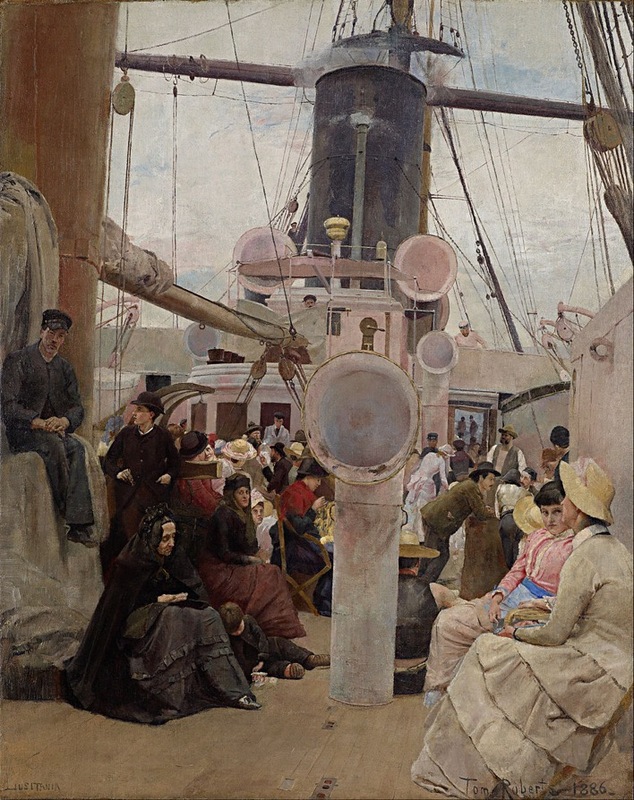 He had travelled on the Orient Line’s Lusitania from London to Melbourne, a journey that would have taken more than a month, and his painting attempts to capture the mood (or moods) on board that particular voyage. Roberts even prints the word “Lusitania” in the lower left corner. The reportorial quality of the image is further emphasised by the random positions of the people and the picture’s slightly off-kilter angle—the sway of ship life. Though an accomplished work, the influence of contemporary artists is evident: the smartly-dressed women in the lower right could come straight out of a James Tissot painting, while the multiple shades of pink and cream suggest the influence of James Whistler. But there is also something surprisingly modern about the composition: the masts, funnels, and pulleys create a geometric symphony in circles and lines. Take off your glasses, let the shapes take over, and we’re not all that far from the abstract playfulness of Sonia and Robert Delaunay. The prominence of circles isn’t inappropriate; after all, Roberts is documenting a journey that will cover much of the globe. And the Lusitania was a modern steam ship; its first run to Australia occurred in 1877, less than a decade earlier. It ran on steam but retained sails, just in case. Thus Roberts’s image captures the moment when an old aesthetic and an ancient technology were losing importance, overtaken by growing confidence in the new. Given the subject matter, it’s perhaps surprising that the sea barely makes an appearance. The only suggestion of water is beyond a pair of figures glimpsed on the right, through the cabin’s open door. Clearly Roberts’s interest is the on-board journey itself: the in-between time that offers its own reality. The passengers are “cast loose from the secure anchorage of settled life,” as Irving has it. Neither home nor adopted home, the ship journey creates a collection of people who might otherwise never have met. In a month’s time, they may be permanently bonded, or they may never meet again. While ships retained a certain degree of separation between those who could afford cabin class and those who suffered in the stuffy, dormitory spaces of steerage, lengthy journeys inevitably allowed for encounters between people of different ethnicities and classes. Roberts captures this in the background, where women in elegant dress mingle with (shudders!) jacket-less men. National differences peek out as well: one man in the distance sports a tam o’ shanter; a woman at her needlework wears a red shawl and black hat that hints at a Welsh background; the informal outfits of several men suggests a familiarity with the outback. And there are signs of new relationships being made: a couple shares some gossip on the left side, while a group on the right huddles over a barrel. Given the energetic mix of life in the distance, it’s interesting that Roberts reserves the foreground for images of seclusion and contemplation. The two women on the right seem to be keeping to themselves: their wary looks and elaborate, light-coloured clothes (a challenge to keep clean in the Victorian era, and therefore a sign of wealth) separate them from the other passengers. A ship funnel divides them from two women in darker dress. The first, probably a widow in mourning clothes, focuses her attention on a child, whose own attention is focused on blocks or cards. The second, whose ‘exotic’ dress suggests she has come from the continent, looks at or beyond us. A man in uniform, probably a ship employee, perches above the others, perhaps atop a pile of canvas-covered luggage. Behind him, and looking away, a dapper young man—could it be the artist himself?—dreams of the future. By foregrounding these more contemplative types, Roberts reminds us of the solitude of migration, the mental challenges of a long sea journey, and the difficulties we find in connecting with those who are different from ourselves. Washington Irving’s essay ends with a similarly divided experience, one that many migrants must recognise. As the passengers arrive at their destination, the narrator tells us, “All now was hurry and bustle. The meetings of acquaintances—the greetings of friends—the consultations of men of business. I alone was solitary and idle … I was a stranger in the land.” But I think Roberts’s image provides hope as well. The sky above the Lusitania may be overcast, but it isn’t threatening. The two wealthy women in the foreground may avoid the crowd, but they can’t keep the crowd from mingling. The little boy playing on deck will grow up in land that is, perhaps, more open and welcoming than the land he’s leaving behind. Thanks for the introduction to a painting I did not know and the Modernist connection is interesting–Demuth?